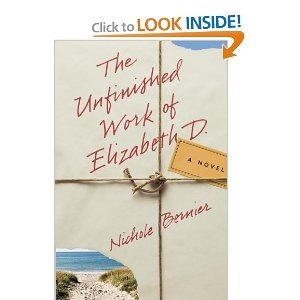 I just finished reading Nichole Bernier’s debut novel, The Unfinished Work of Elizabeth D. It is a novel about Kate, a woman who inherits her best friend’s trunk full of journals after her friend’s tragic and untimely death in a plane crash. Elizabeth wanted Kate to have the journals because “she would know what to do with them.” Kate spends the summer reading the journals, beginning when Elizabeth was just a child recovering from a family tragedy up to the present. She comes to realize how little she really knew about her friend, and maybe how little she really knows about anybody. After all, we are all guilty of carefully editing the parts of our stories that we share and of donning socially acceptable masks to wear in public. Now I lay me down to sleep. I pray the Lord my soul to keep. If I should die before I wake, please throw my journals in the lake. What do you do with your journals? I started keeping journals at a young age. I only had one official diary. It had a plastic cover that was supposed to look like wood grain. And of course it had a lock. In it are my first recorded dreams of being a writer – just like Laura Ingalls Wilder, you know. I kept that diary for years and years, but I don’t remember seeing it anywhere in my last move, so it may be long gone. I kept other little notebooks, too. I remember a tiny Kaiser Fertilizer note pad that I used to take to my “hideaway” beside our house on Boulevard. It was a narrow strip of land, the brick house on one side, the neighbor’s shrub hedge on the other, and a cedar tree at either point. Those were my Harriet the Spy days. There wasn’t much to spy on at Mrs. Todd’s house next door, so I mainly made up stories about what could be happening over there to make life a little more interesting. I have a stack of spiral notebook from my early years of teaching and marriage. I have a few more from the days when my marriage was bad. I quit journaling for a long time when I discovered that my ex-husband had taken one of my journals and made copies of it. That felt like the ultimate of betrayals. I wouldn’t write at all again for a long time. I finally started writing again after we were separated and I was in therapy. It seems I was quite adept at telling my therapist what everybody else in my life thought and felt, but I didn’t have a clue about what I thought or felt about anything. A good therapist (and an author’s husband), he gave me a writing assignment. Spend at least 30 minutes completing these statements: “I think . . .” and “I feel. . .” The first few times I tried it, I threw the notebook across the room in frustration. Then one night I woke up at 3 a.m. I couldn’t go back to sleep, so I turned on a lamp and picked up my notebook. I wrote nonstop for over three hours. Surprisingly enough, I thought and felt a lot of things once I allowed those thoughts and feelings to have a voice. I kept up the journaling for years. Sometimes I used plain old notebooks. Sometimes I chose pretty journals. Sometimes I filled them up. Sometimes I wrote on only a few pages before starting a new one. I keep thinking there is a magic journal and a magic pen out there somewhere – the ones that will effortlessly fill pages with an astonishingly good novel or memoir. I haven’t found them yet, but I am still looking. 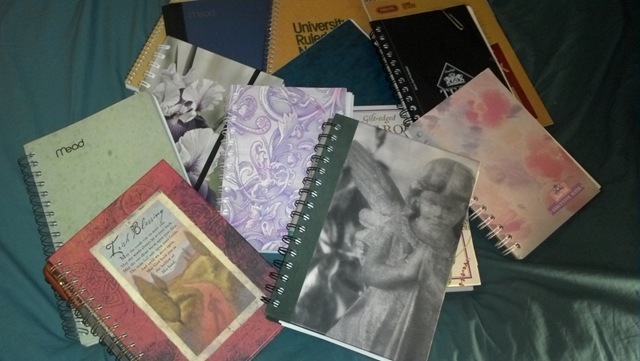 A sampling of some of my journals. My very favorite one ever is the angel journal on top. I filled every page in green ink. In December of 2004, I started blogging. Blogging has been a game-changer for me. At first I didn’t think anyone would read what I wrote. I thought it would be a lot like a regular journal, only online. I was shocked – and a little scared – when people did read it. And they responded! I wrote anonymously for years. Slowly I let the anonymity go. Finally, after much thought and fretting and nail-biting, this summer I went totally public. Church members, high school friends, cousins, parents, colleagues, and total strangers can read what I write and know exactly who wrote it. Amazingly scary. Amazingly exhilarating. There is such a difference between journaling and blogging. I lost it when I discovered my ex-husband had taken, read, and copied my journal. Yet now I blog openly, where anyone who chooses can read. Of course, I edit myself more carefully here than I would in a private notebook. But there is more to it than just that. The evolution of blogs has always been interesting to me. In journals, people are working through questions looking for comfort and insight, essentially asking themselves, What would the wisest person I know advise me on this? It’s a conversation with the best part of oneself. Blogs can be many things — entertaining, poignant, cathartic. But even with the most sincere of intentions, blogs are crafted with the consciousness of another reader. It’s the difference between a candid photo and a portrait. Not much in our world is truly private anymore, which makes journals all the more rare. I rarely journal anymore, although I keep a journal pretty close at hand almost always. Rather than recording emotions, personal experiences, and other typical stuff of journals, I’m much more likely to record quotes, jot down funny/poignant things I’ve heard or seen and don’t want to forget, or brainstorm lists and ideas. Sometimes I miss the old-fashioned journal, the candid photo of writing. Even so, the lake may be a good final destination for my journals one day! Posted in Writing and tagged blogging, journals, Nichole Bernier, The Unfinished Work of Elizabeth D.
Cathy, your encouragement and assurance that I really would not die are what gave me the courage to go public. Thank you! I love reading your blogs and truly enjoy your sermons that Paul is kind enough to bring to me….Keep up the good work! I stumbled across your blog this morning and it’s kizmet that this is the first entry I read. I have journaled for over 20 years now, and like you have kept a private blog for about 3 years, along with my many written journals. I really struggled with going public but I finally did it two months ago. Saturday I made a presentation to 168 women on the benefits of journal writing. What a response! Some shared with me afterward that they’ve never journaled because of fear of discovery. Others vowed to start journaling now because they have some family stories they really want to pass on to their children. Some have shared their stories with me by email since the event. What a blessing it is to journal! Thanks for going public and sharing your contributions to this important practice.